The Way The Pro's Do It?" Getting your foundation layout square and to the correct dimensions is key to building a garage successfully. It is easier than you think if you prepare in advance using one (or both) of the simple, yet accurate, methods shown below. The first method is known as the "3:4:5 Triangle Method" and the second is called the "Diagonal Method." Both are equally accurate as they use the power of the rules of trigonometry in order to achieve squareness which is key to achieving a successful well fitting project. The methods explained herein work equally well if your building a Type 1, Type 2 or Type 3 garage foundation as detailed on the Garage Foundation page. Once you have accomplished your rough grading bring in about 4" of crushed rock and vibrate it into place over the area 2' in every direction past your overall garage foundation footprint. Once you have it compacted and level, you will be ready to start your foundation layout process. No matter which layout method you use, you will need the same materials to accomplish the foundation layout. The materials consist of 2 x 4s x 4' long with an acute angle cut on one end to use as stakes and about 32 lineal feet of 1 x 4 common pine for making your batter boards. You will need a roll of string and some #10 galvanized nails for nailing your batter boards to the stakes after you have driven them into the earth. You will also need a 50' or 100' tape measure for all of your layout work of building a garage. Place your stakes about 4' apart after you determine the general location of the principal four-corner stakes. Keep in mind that these corners will be about 2' further out from your final building corners. This doesn't have to be real precise, just close enough to give you some room on the batter boards to move the string lines back and forth for adjustment purposes when squaring. Once you have the principal four corners in place, then drive the remaining stakes (about 4' apart from the principal corners) into the earth and place your batter boards at all corners. 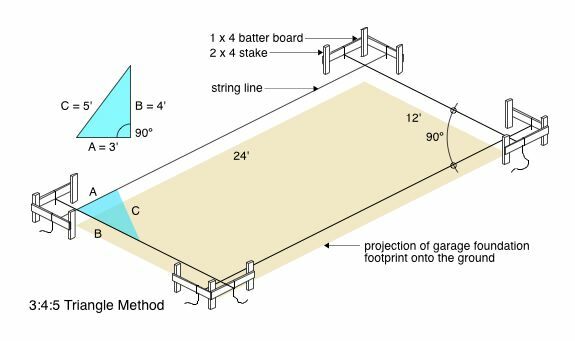 As you can see from the diagram below, the general idea is to place your stakes and batter boards a few feet back from where you intend the outer edge of the garage foundation to land. Usually good practice dictates about 2' clearance between the batter corners and the proposed foundation. That way, even if you temporarily remove your strings so that a backhoe can get in to dig trenches for a Type 2 or Type 3 garage foundation, you can reset the strings after trenching is finished so that you can align the form-work for the stem walls that will sit atop of the spread footing. The "3:4:5 Triangle Method" of layout for building a garage produces a perfect 90º corner as shown in the diagram. It forces your foundation layout to be a perfect rectangle instead of a parallelogram. The basic approach is to roughly layout your string lines to the overall dimensions needed for whatever size garage you are building. Then square-up one corner with a tape measure using the 3:4:5 rule. Then move to any adjoining corner to the first corner, and proceed the same way. After squaring two corners, then check your overall dimensions to make sure you have the size you require. If you do, then all four corners are perfect 90º angles. If not, keep adjusting and squaring two adjoining corners until you have it as close to exact as possible. 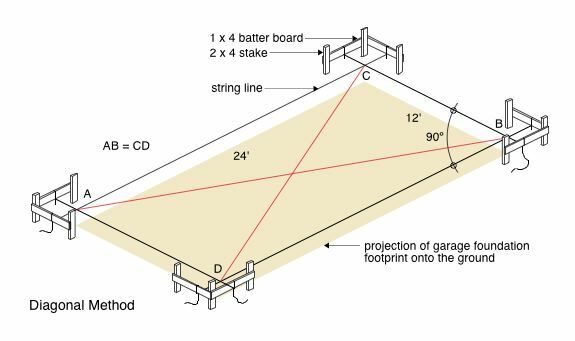 The "Diagonal Method" of layout for building a garage shown in the diagram below works the same way except that you only measure the opposing diagonal corners until you get them the same distance apart. Once the diagonal lines (shown in red) are equal you will have a perfect rectangle. Use the same methods as described above until you have two diagonal dimension readings that are equal and your overall measurements for your foundation are correct. If you are planning on stick building or having a prefab garage placed upon your foundation, the methods described above will work, and once you study them thoroughly you will be well upon your way to learning how to build a garage the way the pro's do it! Once you understand the foundation layout methods shown above you can move on to learning how to form your foundation by studying our Foundation Forming page.